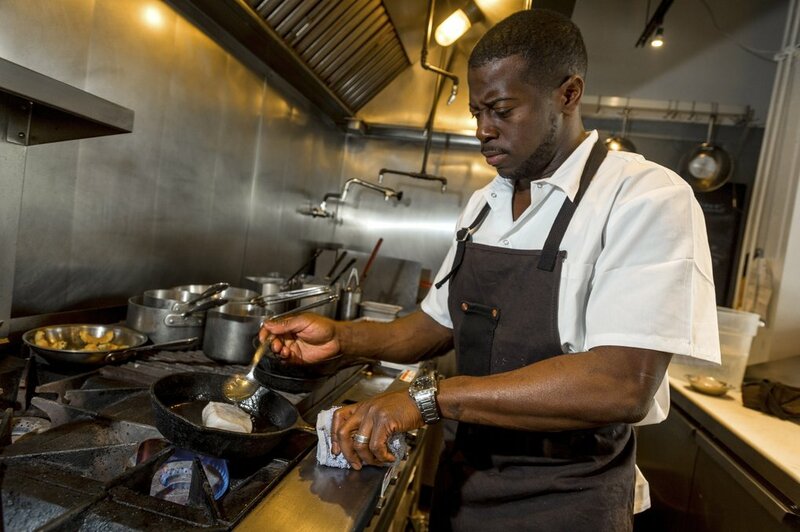 We welcome Chef/Owner Edouardo Jordan of Seattle’s acclaimed restaurant, Salare. Chef Jordan was nominated for a James Beard Best Chef: Northwest in 2016 and has been named one of Food & Wine’s Best New Chefs of 2016. Salare was listed as a Best New Restaurant in America in 2016 by Eater National. Chef Jordan takes influences from France, Italy, the American South, the Caribbean and has quickly become one of Seattle’s hottest restauranteurs. The dinner menu will be paired with a wonderful selection of wines from Law Estate winery. Their primary goal is to manifest the quality of terrific fruit and create a world-class wine. Some of Law Estate’s vines include Clairette Blanche, Marsanne, and Roussanne, as well as a Syrah, Viognier, Roussanne field blend. $150 per person for dinner and wine pairing. This exclusive event will sell out, so please call soon for reservations at 310‑545‑7470 x1.